Why didn’t anyone tell me that my baby will need to use all his senses to learn about his world? Babies are natural born explorers. 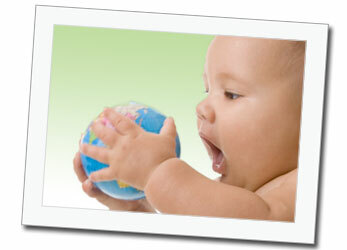 Even everyday objects are new and exciting to your baby and represent an adventure of discovery! Your baby’s hands, eyes, ears and even their mouths are the tools of their trade. For babies, putting things in their mouths is normal and a sign that they are curious. Mouthing objects helps your baby further explore and learn. A baby’s mouth is more sensitive than their fingers. Babies are learning how to use their hands to reach and grab objects but they are not experts yet at using their fingers for exploration. They do no have the ability to stroke, jab or push with their fingers yet. Mouthing helps babies really explore an object and learn about different shapes and textures. As soon as you first hold your baby, you'll both begin to communicate with each other through touch. Those first moments of holding, touching and soothing your baby, teach your baby about the world around her. Your baby's sense of touch begins before birth and develops over the first year. Through her sense of touch, she is able to make new discoveries each day. After human faces, newborns like to focus on colorful of objects and things that move. Give your infant lots of interesting sights to look at, but don't overdo it. One item at a time is plenty. Look for subtle signs that your baby is tired and needs a little break. Infants will often turn their head, look away, have a glazed stare, arch their backs or clench their fists when they are becoming tired. Catching the signs early can help prevent your baby from becoming overtired and fussy. Your baby has been hearing sounds since way back in the womb. Once your baby is born, the sounds of the outside world come in loud and clear. Human voices, especially Mom's and Dad's, are a baby's favorite "music." So talk to your baby, sing songs and yes, even read to your baby. 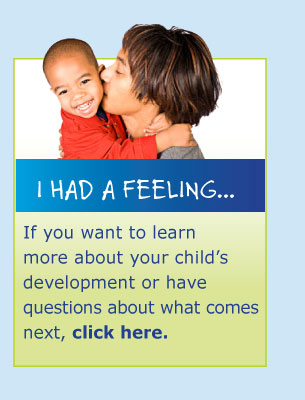 Click here for more tips on communicating with your baby. It's important to keep babies safe and offer them fun and interesting items to put in their mouth, such as textured or soft, plush toys. If you see your baby headed for danger, offer a clean and safe toy instead of scolding. Items should not be able to fit through the opening of a toilet paper tube. Toys that are easy to hold, have interesting textures or make sounds, such as a rattle, are perfect for a baby. 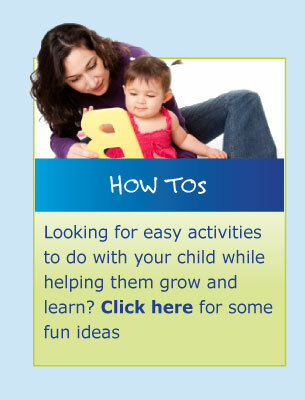 Click here for more information for toy safety for babies at play.